One might view the Belmont Veterans Memorial Pier as a festering platform for fish guts, bird feces and general uncleanliness, but if you take a moment to watch the friends, families and the outdoor community that attend such a rank-smelling structure, you’ll soon realize it’s an irreplaceable facet of our dear city’s beach culture. The pier is a place to congregate, to unwind from a tough day stuck in the office and a place to enjoy the salty sea breezes that continually grace the sun-weathered faces of the more consistent pier-goers. 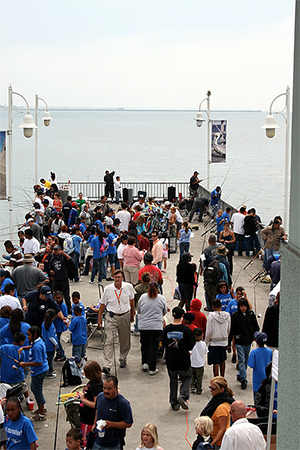 Come tomorrow, one of the many facets of pier culture will come in the form of the 61st Annual Kids’ Fishing Rodeo. Presented by the Port of Long Beach and Alfredo’s Beach Club and part of the Summer Beach Party event series, boys and girls ages 16 and under will have the privilege of partaking in a smelly (yet satisfying) summer day standing over the Pacific Ocean. The youngins will compete for trophies as well as receive free bait and instruction. All those under 16 can participate for free and those under the age of 12 must be supervised by an adult. Kids participating must bring their own rods and reels, fishing line and tackle. Prizes given at past rodeos have included mountain bikes, trophies and other goodies. Food and beverages will be for sale at Buoy’s on the Pier. Come support the kids as they attempt to wait patiently for a bite—chances are you’ll see a sea lion or a dolphin as you while away the morning. The 61st Annual Kids’ Fishing Rodeo will take place at the Belmont Veterans Memorial Pier from 8:00AM to 12:00PM.